Download "MEDICARE ACCESS AND CHIP REAUTHORIZATION ACT (MACRA) MERIT-BASED INCENTIVE PAYMENT SYSTEM (MIPS) ADVANCING CARE INFORMATION PERFORMANCE CATEGORY"
4 Registry Reporting objective, the measure is a yes/no statement of whether the MIPS-eligible clinician has completed the measure. Only a yes statement would qualify for credit under the base score. To earn points in the base score, a MIPS-eligible clinician would only need to complete submission on the Immunization Registry Reporting measure of this objective. Completing any additional measures under this objective would earn one additional bonus point in the advancing care information performance category score. 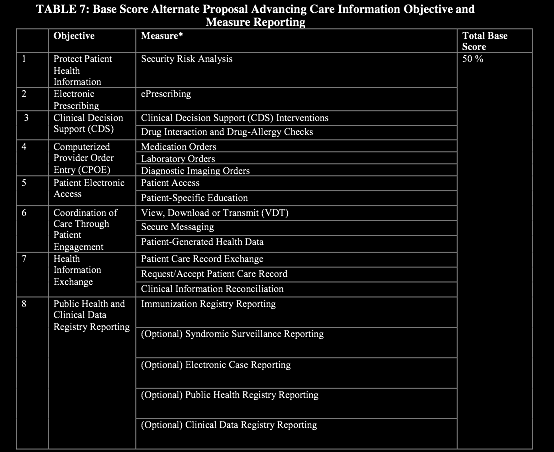 Base Score Alternative Proposal Successfully submitting a numerator and a denominator for each measure of each objective would earn a base score of 50 percent for the advancing care information performance category. Failure to meet the submission requirements or measure specifications for any measure in any of the objectives would result in a score of zero for the Advancing Care Information performance category base score. 6 category. CMS states this methodology allows flexibility for MIPS-eligible clinicians to focus on measures that are most relevant to their practice. Overall Advancing Care Information Performance Score To determine the MIPS-eligible clinician s overall Advancing Care Information performance category score, CMS would use the sum of the base score, performance score and the potential Public Health and Clinical Data Registry Reporting bonus point. Scoring Considerations The law gives CMS the authority to reduce the percentage weight of the Advancing Care Information performance category (but not below 15 percent0 in any year in which the Secretary estimates that the proportion of eligible professionals who are meaningful EHR users is 75 percent or greater. Any decrease in the weight of the Advancing Care Information performance category would be offset by increasing the weight of other performance categories. CMS is alternatively proposing to estimate the proportion of physicians who are meaningful EHR users as those physician MIPS eligible clinicians who earn an Advancing Care Information performance category score of 50 percent (which would only require the MIPS-eligible clinician to earn the Advancing Care Information base score). Exclusions By excluding from MIPS those clinicians who do not exceed the low-volume threshold (proposed as MIPS-eligible clinicians who, during the performance period, have Medicare billing charges less than or equal to $10,000 and provide care for 100 or fewer Part B-enrolled Medicare beneficiaries), CMS believes exclusions for most of the individual Advancing Care Information measures are no longer necessary. 8 submit any data for any of the measures specified. CMS encourages all NPs, PAs, CRNAs and CNSs to report on these measures to the extent they are applicable and available; however, CMS states that it understands that some NPs, PAs, CRNAs and CNSs may choose to accept a weight of zero for this performance category if they are unable to fully report the Advancing Care Information measures. Medicaid CMS does not propose any changes to the objectives and measures previously established in rule making for the Medicaid EHR Incentive Program, and thus eligible professionals participating in that program must continue to report on the objectives and measures under the guidelines and regulations of that program. Accordingly, reporting on the measures specified for the Advancing Care Information performance category under MIPS cannot be used as a demonstration of meaningful use for the Medicaid EHR Incentive Programs. Similarly, a demonstration of meaningful use in the Medicaid EHR Incentive Programs cannot be used for purposes of reporting under MIPS. Support for Health Information Exchange and the Prevention of Information Blocking MACRA requires that an eligible clinician, EP, eligible hospital or CAH must demonstrate that it did not knowingly and willfully take action to limit or restrict the compatibility or interoperability of the certified EHR technology. CMS is proposing to require a three-part attestation from all eligible clinicians under the Advancing Care Information performance category of MIPS, including eligible clinicians who report on the Advancing Care Information performance category as part of an APM Entity group under the APM Scoring Standard. First, the eligible clinician, EP, eligible hospital or CAH would be required to attest that it did not knowingly and willfully take action (such as to disable functionality) to limit or restrict the compatibility or interoperability of certified EHR technology. Second, the eligible clinician, EP, eligible hospital or CAH would be required to attest that it implemented technologies, standards, policies, practices and agreements reasonably calculated to ensure, to the greatest extent practicable and permitted by law, that the certified EHR technology was at all relevant times: connected in accordance with applicable law; compliant with all standards applicable to the exchange of information, including the standards, implementation specifications, and certification criteria; implemented in a manner that allowed for timely access by patients to their electronic health information (including the ability to view, download, and transmit this information); and implemented in a manner that allowed for the timely, secure and trusted bi-directional exchange of structured electronic health information with other healthcare providers, including unaffiliated providers, and with disparate certified EHR technology and vendors. Third, the eligible clinician, EP, eligible hospital or CAH would be required to attest that it responded in good faith and in a timely manner to requests to retrieve or exchange electronic health information, including from patients, healthcare providers and other persons, regardless of the requestor s affiliation or technology vendor.